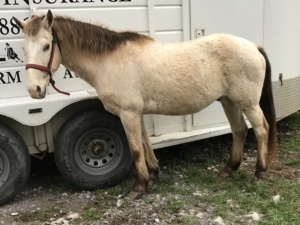 Vito is an 8 year old, approx 52″ tall pony. He loads and unloads from the trailer well and stands tied very patiently. We are unsure of Vito’s past, but he does have some underlying trust issues. He has proven to be extremely unpredictable under saddle even with extensive training. For this reason, Vito is not a candidate for riding and is adoptable to an experienced horse person as a companion pony ONLY. He needs an understanding home where he can be a pony. Vito’s adoption fee is waived to an approved home.